Samuel Cedars has a gorgeous outdoor ceremony space for bride's to use. This manicured area is tucked behind the event space with cedar trees surrounding it. These tall trees are an ideal spot for bridal portraits. Following the ceremony, the sun was setting which gave us unique lighting to add to this couple's wedding gallery. 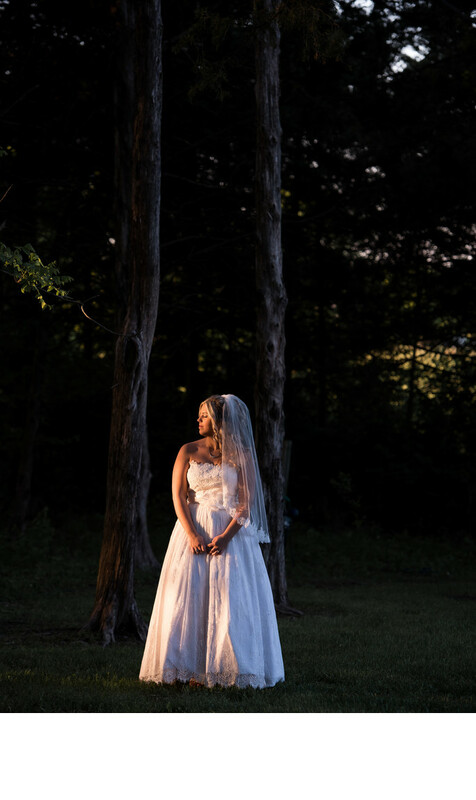 I love this simple, yet impactful moment of my bride just a few minutes after she became a wife. She stood, hands clasped, eyes closed, reflecting on the day that she had been planning for months. Her wedding veil laid perfectly over her shoulders while the lace detail on the bottom of her gown hovered slightly over the ground. I love creating clean, sharp wedding portraits for my couples. I want their gallery to be filled with images that are unique to their wedding.